It’s time again for our annual Best of Des Moines awards. As in past years, our readers voted via an online open-ended survey for the businesses, people and events that they thought were the “Best of Des Moines.” We simply tallied the votes in all 74 categories. 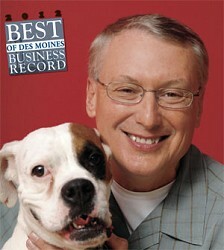 Congratulations to all of the 2012 Best of Des Moines winners. As always, if you have questions, concerns, or feedback about the product, feel free to reach out directly to me at chrisconetzkey@bpcdm.com. • Francis & Associates Inc. WINNER: Davis, Brown, Koehn, Shors & Roberts P.C. • Brown, Winick, Graves, Gross, Baskerville and Schoenebaum P.L.C. • Caribou Coffee Co. Inc.
• Plaza Florist & Gifts Inc. WINNER: Principal Financial Group Inc.
• Suku Radia, Bankers Trust Co.
• Michael Sadler, CenturyLink Inc.
• Fred Buie, Keystone Electrical Manufacturing Co.
• Larry Zimpleman, Principal Financial Group Inc. WINNER: Wells Fargo & Co.
• Principal Financial Group Inc.
• Northwestern Mutual Life Insurance Co.
• Farm Bureau Life Insurance Co.
• Nationwide Mutual Insurance Co.
• McGowen, Hurst, Clark & Smith P.C. • BTC Capital Management Inc.
• Wolin and Associates Inc.